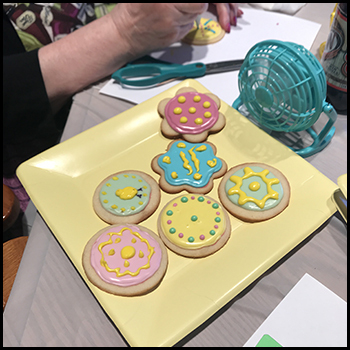 This past August, I set up my Royal Icing lab to test Royal Icing consistencies to show you how to have guaranteed results every time (because, frankly, mine had been inconsistent). Unfortunately, August set a record in New Jersey for the hottest summer on record and when the temperature cooled, the humidity went up. Despite the humidity, the now 70-degree weather felt great, so while conducting my tests, I threw open my windows, turned off the air conditioner, and enjoyed the natural warmth of late summer. What I didn’t realize at that time was that the humidity hit 100%. The atmosphere became so moist in our house, that all our wood floors buckled and my sheets of experiments became soggy and unable to hold a shape. It took almost two months before our floors flattened. The soggy green Royal Icing below was from one of my experiments. It started out as hard! When I got up the next day after it had hardened, our apartment was filled with smoke, which turned out to be fog. Unfortunately, all my samples from the previous day turned into textures similar to raw eggs. 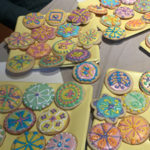 I initiated this project to find out for myself why some Royal Icing worked, while others didn’t, because I have not been uniformly successful over the year I’ve been involved making Royal Icing. 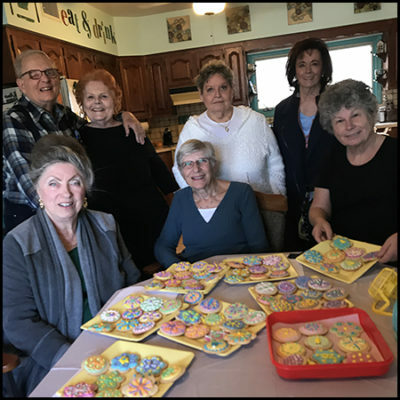 My primary online tutorial instructor was Stephanie Kappel of Better Basics for Exceptional Cookies with Stephanie Kappel, who provided a crispy recipe with her course. Several batches of butter cookies later, however, I found a recipe by Karen Anderson on Julia Usher’s website that I liked better. By adding corn syrup to the basic recipe, Karen’s version made slightly soft, very glossy coating that was almost foolproof. Crisper frosting in my own novice hands formed bubbles, dents, and cave-ins, like you see below. As I became more skilled, subsequent trials with crisp Royal Icing looked great after applying it, but awful the next day. Most commonly, my crispy dots and piped lines broke. I had a difficult time making rounded dots, as you can see below, although online trainers suggested that I was having consistency issues. By myself, even after copious research and trials, I couldn’t resolve them. I was so frustrated that I went online asking for help. Friends from Julia Usher’s Facebook Group jumped in right away and told me that I needed to quickly dry my cookies under a fan to avoid cave-ins, which helped a lot, but I still had a problem with broken bubbles. After switching to Karen Anderson’s recipe, I rarely had trouble again, but there was a downside to using more flexible frosting. I was not able to produce thin, crisp piping that I learned I could achieve from Stephanie’s Craftsy tutorial. 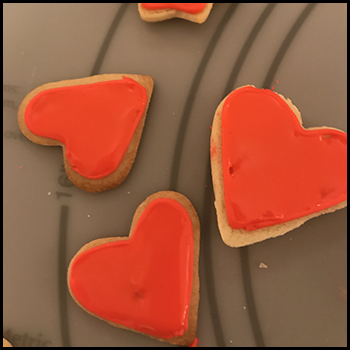 You might fall in love with a cookie design or designer, but I learned that if you don’t use her or his same recipe, you might fail. 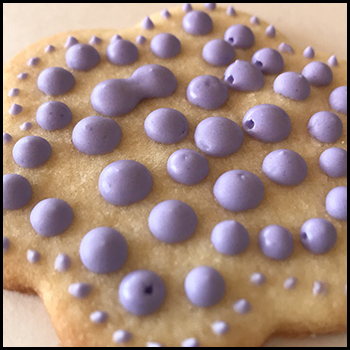 Shaking a freshly frosted cookie to make bubbles rise to the surface so you can pop them works with crisp frosting, but not soft. If you rely on shaking soft frosting, you’ll produce ripples in what should be a smooth surface and ruin your cookies. 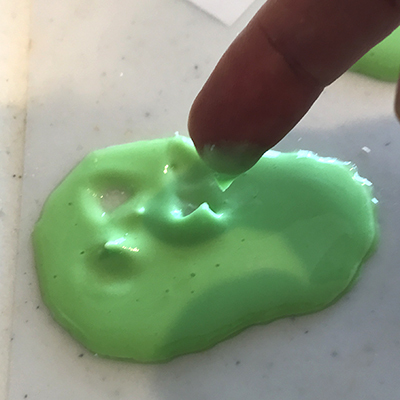 I suspect, too, that although soft frosting is flexible, it may not have the proper texture for wet-on-wet techniques because it can introduce rippling that is similar to what happens when shaken. That said, I did successfully produce a few, but to do so, I had to work quickly. With soft frosting, however, I can quickly show new people how to decorate cookies without flaws. The photo below, for example, shows my sister-in-law’s first try! Everything she did looked beautiful as did those of her guests who attended the frosting party I led. Not a cracked bubble or sunk surface in the several dozen cookies frosted that day. 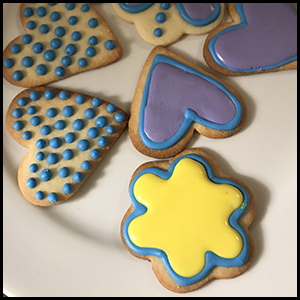 Liesbet’s article continues with an overview of products that can be used in Royal Icing (corn syrup, glucose, and glycerin), in addition to the standard (called plain). From there, Liesbet runs experiments and documents results of different Royal Icing mixtures, including plain. Her pictures tell the story, with fan-dried, corn-syrup based frosting looking the best on cookies that feature a single layer of flooded icing. Under all circumstances, I’ll dry the frosting under a fan as air drying can ask for disaster. The articles will appear weekly until I’ve exhausted the experiments, then I’ll move on to Royal Icing stenciling.